The leafy views and all-seasons outdoor options are unbeatable at this three-bedroom, one-and-a-half-bathroom Ludlow cottage right on the water. Welcoming up to seven guests and two dogs, it's perfect for a Green Mountain getaway with friends or family! Located on picturesque Echo Lake, with options including boating and fishing, this home is also just five miles from Okemo Mountain Resort for skiing, snowshoeing, and summer mountain biking. Just a bit farther lies even more world-class slopes at Killington Mountain Resort. This bi-level home features a rustic design interior with wood and stone accents, an electric fireplace comfortable furnishings, and modern kitchen appliances for quick and easy meal prep. You'll also find a large yard with a screened-in gazebo for al fresco dining, and a BBQ grill. Three bedrooms, two with a queen bed each and one with a twin bunk bed set, will keep you comfy. A private washer/dryer will keep your ski wardrobe clean. WiFi and a TV with a DVD player provide entertainment. Up to two dogs are welcome with an additional pet fee. In addition to skiing and lake-going, this location allows you to easily get to Manchester for shopping and dining. Meanwhile, the area is surrounded by hiking trails for all levels. 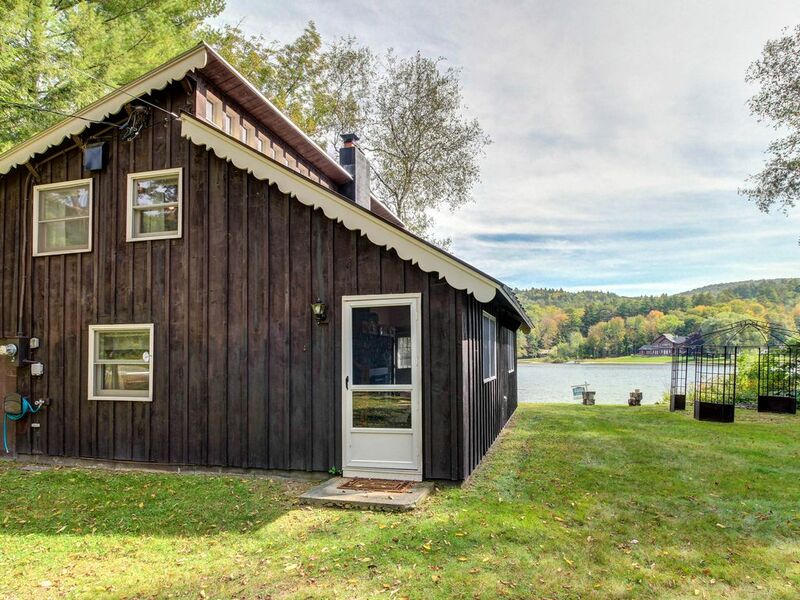 Explore Vermont's incredible outdoors at this lakefront cottage - reserve your dates today! Parking Notes: Parking is in front of the house. This cottage is clean, well stocked with all you will need for a comfortable stay. Plenty of kitchen gear, blankets, sheets, clean towels. Very well kept. We went for a short skii trip, but it must be gorgeous in the summer as well. You will feel like home instantly! Close to Okemo but a non working fireplace. This house was very difficult to find using our GPS. We eventually found it using Waves on our phone. The driveway was a sheet of ice when we were unloading the cars. It was a cute small home. The description said “fireplace” so we thought we’d be able to use it but there was a fake log insert and we weren’t able to use fireplace. The coffee pot was a keurig which would have been helpful if that was in the description as I would have brought pods. There was an outside fire pit but with the ice and snow tough to use. In the summer this place would likely be nice as it’s right on lake. We were disappointed with VRBO’s handeling of our complaints. Next time they said to call to clarify what a fireplace means. Good to know. Hello Tracy, we hope you enjoyed your stay! We make every effort to present clear, accurate descriptions of our homes in order for guests to make informed decisions on their rental choices. We encourage guests to reach out with any questions or concerns prior to booking, as we are happy to help! We look forward to hosting you again soon! Very charming and had all of the necessities! Easy to book and easy to access! 10 min drive to most nearby eateries and activities which made it perfect for our own privacy and no congestion to deal with! This little cabin tucked away on Echo Lake was perfectly represented by the pictures and description. The house has all of the amenities necessary to be comfortable, yet maintains it's rustic, lived in charm. The scenery on the lake is unmatched. It is an easy drive to nearby little towns. I will definitely be back! This property was extremely well represented by its description and pictures. This well maintained cottage had the unique cabin feel while having an INCREDIBLE backdrop to take in the beauty of the fall season. While ot was private and peaceful, it was close enough to some small towns to get out and explore. I would definitely come and stay here on another trip to Vermont. Happy to find a pet friendly and affordable lakefront home in VT. House was as pictured, no surprises. There is no grill or tables for outdoor dining. We planned accordingly and brought our own. Dogs loved the water, beautiful spot. Although on a busy road set back far enough it was not an issue. We would stay again.